Partners from the UK, Wales, Ireland and Germany have reunited for a second season of stop-motion children’s series Igam Ogam. Broadcasters Channel 5, TG4 and S4C and distributor ZDF Enterprises are backing the new season, with Emmy-winning Irish company Telegael and Cardiff-based Calon TV producing. The series will be broadcast in the autumn in Channel 5’s Milkshake strand and on Welsh pubcaster S4C. Production has moved from Wales to what Paul Cummins, CEO of Telegael, described as “the first dedicated stop-motion studio in Ireland”. Telegael has set up the studio in Casla in Connemara to produce the second season of the show, the first of which was produced in 2009. Cummins said his company had made a “significant investment” in the studio and that moving Igam Ogam there would create 40 jobs in the region. “We hope Igam Ogam will be the first of many stop-motion series and feature films to be made here,” he said. ZDF Enterprises will distribute the new series internationally. 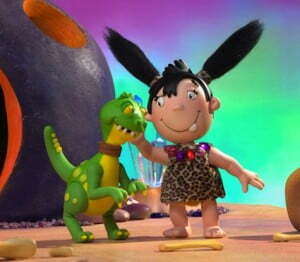 Igam Ogam (52×10′) follows a Stone Age cavegirl “who faces the daily challenges of prehistoric life with invincible optimism.” It is voiced by Ruth Jones (Gavin & Stacey) and directed by Ben Halliwell. The toon’s executive producer is Calon MD Robin Lyons (Hana’s Helpline, SuperTed, Hilltop Hospital, Fireman Sam).